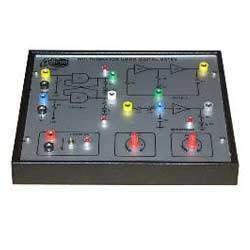 Leading Exporter of 4 bit binary counter trainer, basic logic gates trainer, full adder trainer, multivibrators using digital gates trainer, ex or & ex nor gates trainer and half adder trainer from Mumbai. Completely self contained stand-alone unit. 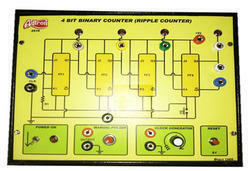 Demonstrates the working of a 4 bit binary counter (ripple counter). Built-in facility for reset of all flip flops to start count from 0000. Built-in “bounceless manual pulser” useful for freezing the action of each stage of the counter after every clock pulse. Built-in clock for observing continuous action of counter. Counting starts from 0000 to 1111 and resets to 0000. Observation of input & output of each stage. 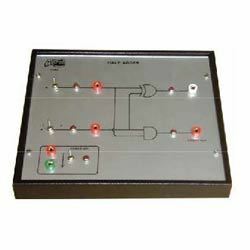 Being a leader of this domain, we offer the optimum quality of Basic Logic Gates Trainer. Rendered by us at cost effective prices, the offered basic logic gates trainer is used to study the concepts of basic logic gates by using IC. 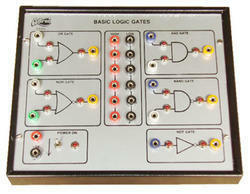 In addition to this, the offered basic logic gates trainer is rendered at industry leading prices. Demonstrates the characteristics of basic digital gates using ic. One gate of each variety. Bank of 4 each, high logic, low logic, respectively. Verification of truth table of each gate. Housed in a elegant cabinet with a well spread intelligently designed circuit layout on the front panel. Built-in dc regulated power supply with short circuit protection & led indication for supply “on work on 230v ac mains. Demonstrates the characteristics of basic full adder using digital ic. Verification of truth table of full adder. Built-in dc regulated power supply with short circuit protection & led indication for supply “on” to work on 230v ac mains. Valued as a reliable manufacturer and supplier, we offer the optimum quality of Multivibrators Using Digital Gates Trainer. 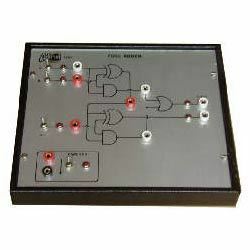 The working of a Seven Segment Decoder Driver is study by using this trainer. Besides this, the quality of the offered multivibrators using digital gates trainer is never compromised at our end. Demonstrates the working of a Seven Segment Decoder Driver. Facility for giving BCD inputs and observing decoded decade output on seven segment display. Decade output on seven segment LED display. Strongly supported by a comprehensive instruction manual complete with theory and operating details of the Decade Counter. Motivated to attain optimum client approval, we offer the best quality of Ex Or and Ex Nor Gates Trainer. 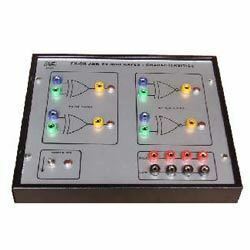 For the purpose of the characteristics of basic ex-or and ex-nor gates using digital IC, the offered trainer is used. The offered ex or and ex nor gates trainer is available with us in bulk quantities, in accordance to the customer requirements. Demonstrates the characteristics of basic ex-or and ex-nor gates using digital ic. Verification of truth table of ex-or and ex-nor gates. Keeping the track of latest happening in this domain, we have been able to manufacture and supply the best quality of Half Adder Trainer. The offered half adder trainer demonstrates the characteristics of basic half adder using digital IC. Its robust construction, make this half adder trainer highly demanded. Demonstrates the characteristics of basic half adder using digital ic. Verification of truth table of half adder. Looking for Basic Digital Electronics ?